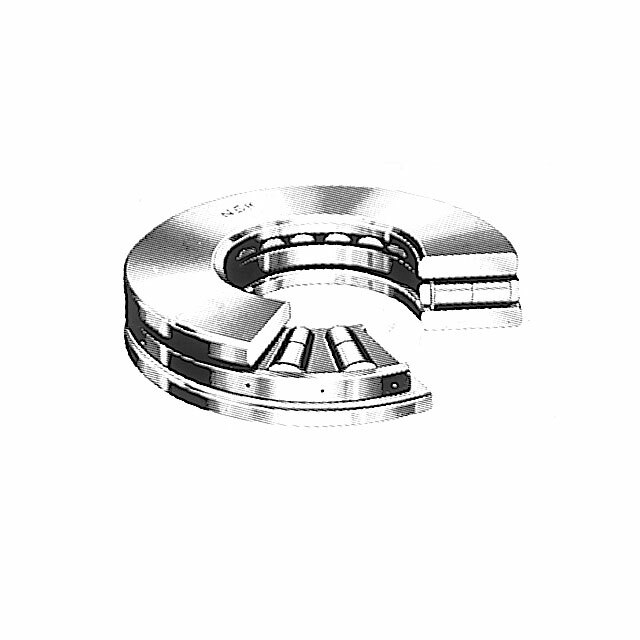 These are thrust bearings containing cylindrical rollers. They can sustain only axial loads, but they are suitable for heavy loads and have high axial rigidity. The cages are machined brass. These are thrust bearings containing convex rollers. They have a self-aligning capability and are free of any influence of mounting error or shaft deflection. Besides the original type, the E type with pressed cages for high load capacity is also available. Their bearing numbers are suffixed by E.
For horizontal shaft or high speed application, machined brass cages are recommended. For details, contact NSK. Since there are several places where lubrication is difficult, such as the area between the roller heads and inner ring rib, the sliding surfaces between cage and guide sleeve, etc., oil lubrication should be used even at low speed. The cages in the original type are machined brass.